The Samurai Archives Citadel // View topic - What is this instrument? Posted: Thu Sep 17, 2009 5:26 am Post subject: What is this instrument? I am trying to figure out what this intrument is. Anybody know? 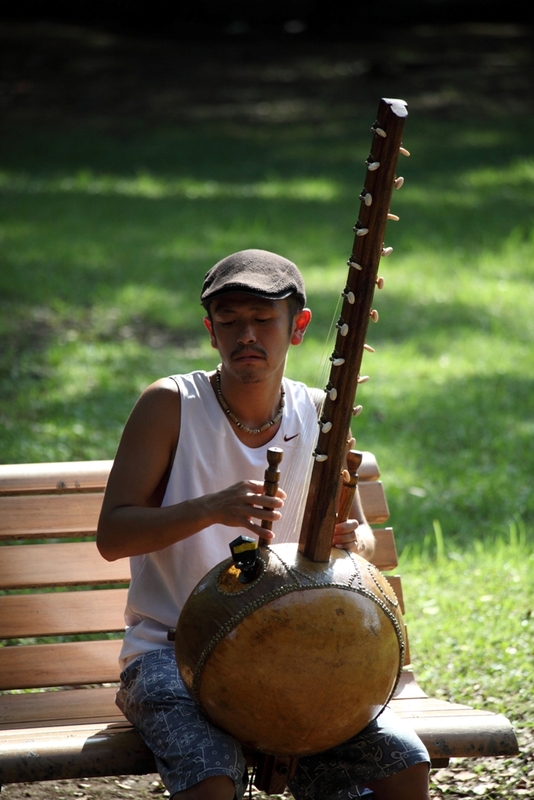 This guy is playing it at Yoyogi park. I don't know what that one is, but China has a whole passel of funky stringed instruments. Not Japanese as far as I know. Looks African to me. It seems to be a kora, from West Africa. Thanks. I had made an assumption since it was a guy playing in a J park. Ooops. Dean Wormer, President of the SA College of Higher Samurai Knowledge, says, "Son, making assumptions and being a philistine who watches Lone Wolf and Cub movies on a weekend is no way to go through life. Instead, you should be enjoying fine Hostess brand snacks, eating Pocky, and reading Sharpe and Turnbull. Then you can be fat, happy and misinformed, and that, son, is the proper way to go through life." Dean Wormer also says, "I recommend the fine films Shadow Hunters 1 & 2. Mrs. Wormer can't get enough of Yujiro, even though he is a bloated and drunken fool. I disagree with that clown, Obenjo, who thinks those films should be on double secret probation because he says they're terrible. What does that moron know about films?" And I thought it was Chinese 'cause they have some FUNKY looking instruments. Ah, be careful. You don't want to assume. Obenjo, I assume you are talking about me. Hey, don't assume anything! I don't think for Dean Wormer--I am only just the messenger. I wouldn't dare try to assume what he thinks. He never has been himself after Faber College dismissed him following the Delta House incident. All he talks about these days are twinkies, ding dongs and the perils of geting hoked on bad samurai films staring Ishihara Yujiro. From what I understand, Yujiro would fit right in at a Delta House toga party, although I'll bet he couldn't stuff a whole hamburger in his mouth. Then again, Katori Shingo could, so...well, where's this going anyway? Shingo is more like Douglas J. Niedermeyer, anyway. And your message from the Dean would be "The time has come for someone to put his foot down. And that foot is me." He never has been himself after Faber College dismissed him following the Delta House incident. He ended up as a small college town police officer in "Killer Klowns From Outer Space" and was put to good use as an undead ventriloquist's dummy by a Klown. You know what's a neat instrument? The hang (prounounced something like "hah-ng" - short 'a' sound, not long 'a' sound like the English word 'to hang'). When I was living in London, I saw people playing them on the street, at street fairs, and in a modern/contemporary avant garde reimagining of a Noh play. Haven't seen (or heard) them since.